Those of you who have been following our website over the years may recall my support of the campaign to ban driven grouse shooting and stop the persecution of Hen Harriers, Birds of Prey and other wildlife species on moorland in the North of England and Scotland. 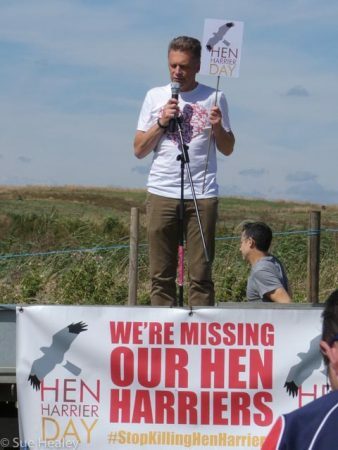 2018 is the fifth anniversary of the first Hen Harrier Day when I travelled to my home County of Derbyshire where I joined the now infamous “sodden 570” gathered in the Peak District. This year I met up with Hazel and Steve representing Gravesend Group at Rainham Marshes. Each year an increasing number of events are held, bringing more people together to celebrate the Hen Harrier and its plight, and to also highlight the (mis-)management of our wild areas and the impact it will have on all of us in the future. Many birds of prey are still being illegally killed, along with any other wild creature that could prey on grouse. This includes corvids, foxes, badgers, weasels, stoats, even hares are shot as they have the ability to carry ticks which might carry diseases which could transfer to the grouse. Indiscriminate killing of these species is changing the balance of nature across many acres of moorland. The subject is now being discussed in national newspapers, on television and radio and in social media. Politicians are getting involved. This year at Rainham Mark Avery, Chris Packham, Martin Harper (RSPB Director of Global Conservation), and Ruth Tingay (conservationist) were joined by both Natalie Bennett (Green Party) and an impromptu piece from Barry Gardiner (Labour) – and yes, they did both have binoculars. In 2014, there were only three Hen Harrier nest sites in England, when scientific studies showed there was sufficient suitable habitat to support 300+ nests. This year, with more publicity and volunteers providing round the clock protection of Hen Harrier nests in England there were nine known successful nesting attempts in England, producing 34 fledglings. Increasing numbers of birds are being radio tagged and we are getting more scientific data to help provide evidence for losses and also obtain more information to enable protection for our wildlife. This is a great step forward but still a long way short of the 300+ nests we are capable of supporting. Studies have shown at this rate of increase it will take until 2068 before we are anywhere near 300. Having attended events each year since 2014, I am increasingly proud to be part of such a worthwhile campaign. The iconic Hen Harrier, which used to be such a regular part of the Kent landscape when I moved here in the mid-1980’s, is now confined to the occasional winter visit, a very sad situation indeed. Over the years the campaign has developed from protecting one species – our “sky-dancing” Hen Harriers, to protecting the biodiversity of the whole country for wildlife and people. An excellent report Sue and glad that so many attended the day. All of the guest speakers spoke with passion about how the harriers are still being persecuted by farmers with pound notes in their eyes. Apart from Chris Packham, the standout speaker for me was Natalie Bennett. As a Green party ex leader, she spoke with gusto and knew how to deliver a knowledgeable, informative dialogue. We can all do our part in this campaign and for those that were unable to attend, please take the time to see Sue’s youtube link of the event. The other links are well worth following too.